About two years ago I posted my mathematical assessment of the market's fair value. It's still a widely-referenced article. Given your interest and my own curiosity as I prepare my investment route for 2011, I thought I'd repeat that study using more recent data. 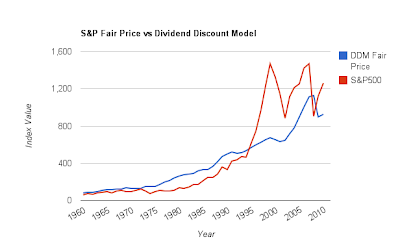 But this time, I'll use both a dividend discount model and an earnings growth model. 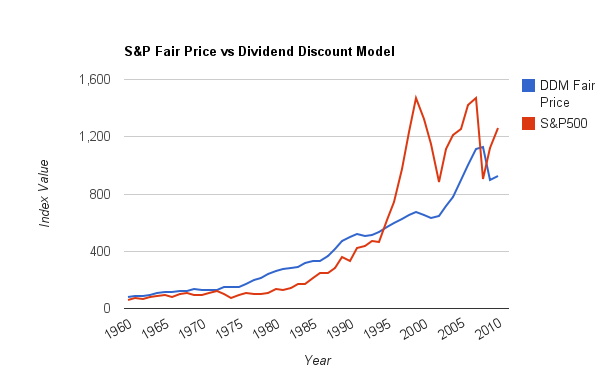 Using the Dividend Discount Model here's a quick summary of the market today and what is in store for 2011, if history helps. If we treat a stock as a bond and nothing else, we're expecting to get in the future our model for dividends that we got in the past, plus some growth. This is one of the most conservative ways I know to value a stock and hence why I'm using it here to value the index. All-Time Dividend Growth. Since 1960, the S&P 500 has grown dividends an average of 5.04% per year (note: variance is large, meaning some years this number is much higher, others much lower). 10-Year Dividend Growth. The last 10 years have seen a lower dividend growth, just 3.58% annually. Today's Fair Value. Assuming a 5% growth ad infinitum a 7.5% discount rate based on an estimated dividend for 2011 of $24.28, today's fair value is 971, meaning the market is overvalued by 33%. Modeled value vs. real value for S&P 500 using DDM. 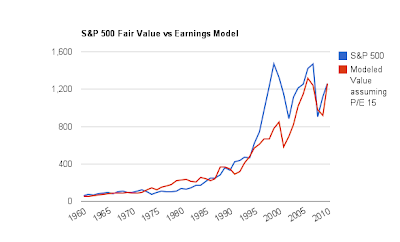 Earnings provide another way to assess the fair value of an index. By looking at historical growth and current earning yield, we can put a fair price on the index. However, earnings are a secondary measure of what one can get out of an index, since not all earnings flow to the investor as dividends. While earnings can give us a good feel for how the market is doing, it can't tell us what the companies will do with their earnings nor how they will return them to us investors. Dividends can be cut, but earnings are flakier, given that they're not usually thought as belonging to shareholders, which is a shame, but quite true of most companies. All-Time Earnings Growth. Since 1960, S&P 500 earnings have grown an annualized 6.81%. 10-Year Earnings Growth. For the trailing 10 years, earnings have grown 4.07%. Today's Fair Value. Assuming 2011 earnings of 87.84 and applying a P/E multiple of 15, the S&P would be valued at 1318 today, meaning the market is undervalued by 1.7%. 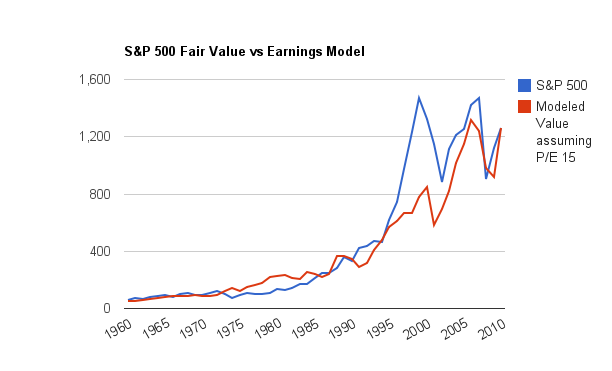 Modeled value vs real value for S&P 500 using earnings. Whether you choose to believe the DDM is more accurate or the earnings approach is more accurate, both currently indicate that the S&P is anywhere from fairly-valued all to the way to grossly overvalued. However, this numerical assessment assumes a smooth continuation of history without taking into account all that is going on with the economy, international affairs and expectations of inflation/deflation. Use this to help you make informed decisions, but do not rely entirely on it. The source of raw data is still here (no affiliation with the authors or their institutions). Disclosures: I own SPY and many other whole market-tracking indices at the time of writing.